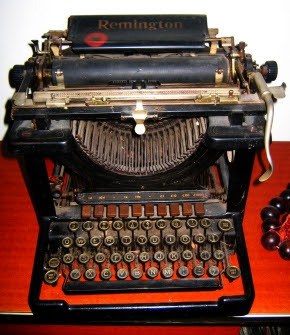 Just thought I'd post a picture of one of my old typewriters. I actually used to use this one until common sense prevailed. Imagine typing and typing and typing a story out and then having to copy it all out on the computer, then to go through the editing process. I used to have to maintain it, the ribbon used to jam up, guests would come over and pound the keys. I also loved the feel of it though. I think this one was made in 1908. Next year it will be an official antique. If it wasn't for the size that old typewriters took up, I think I would collect them.